PHUKET: More than two and half years after construction of one of the busiest roads in Patong has been completed there are still no street signs in English along the road so that tourists in the “international tourist destination” know which road they are actually on. Worse, the two authorities responsible for what most local expats know as “Phang Muang Sai Kor Rd”, which runs the entire length of Patong, has no signs in English – or any other language people who cannot read Thai will understand – nor are they forthcoming in the near future. Phang Muang Sai Kor Rd literally translates as “Town Plan Line/Route A Rd”, the name it was initially given during its construction as the town plan needed to attribute some form of identification to the road under construction. However, the name has stuck, despite a public poll years ago that decided the busy thoroughfare should be called “Phra Metta Rd” – with “Phra Metta” meaning “benevolence” or “kindness”, in keeping with the names of other major roads in Patong, such as Phra Baramee Rd, meaning “Prestige Rd” (or “Road of Prestige”). To the Phuket office of the Department of Rural Roads (PDRR), which built the road over the contracted 900 days at a budgeted cost of B211 million, Phra Metta Rd is called Route 4055, according to their own naming system for roads they build, and further signs or dedication of names are – according to them – not their job. “The road was actually completed in April 2014 to help ease traffic congestion,” PDRR Director Theerapol Jirarantankorn explained. As such, the road also serves as a critical conduit throughout the town, as it connects with Phra Baramee Rd at the northern end of Patong, passes by the front doors of Patong Police Station and Patong Hospital, then continues behind the Jungceylon shopping mall and connects at the roundabout at the southern end of Patong so traffic can continue unimpeded onto Sirirat Rd to Karon, the next beach resort town to the south of Patong. Only two other roads run the entire length of Patong: Thaweewong Rd (the beach road) and Rat-U-Thit 200 Pi Rd – and both are one-way. The new road, yet to be signed in English, allows two-way traffic. “Phang Muang Sai Kor refers to the project name of Phuket roads during their construction, and there are many of these, such as Phang Muang Sai Kor 1 (Route A1), Sai Kor 2 (Route A2),” PDRR Director Theerapol explained. “Most roads we build are renamed after the project is completed, but locals still call this road by its project name (Phang Muang Sai Kor Rd),” he noted. Mr Theerapol pointed out that the PDRR has posted one sign at each end of the road, revealing its true name of “Phra Metta Rd” – but the signs are in Thai only. “We are no longer responsible for naming the road. We built it and under the contract terms of construction we are still responsible for repairs to it, and we have posted signs marking the road’s name as ‘Phra Metta Rd’ – but we are not responsible for any more than that,” he said. “After the warranty period has concluded we will officially hand over responsibility for the road to Patong Municipality. They can put up more signs if they want,” he added. 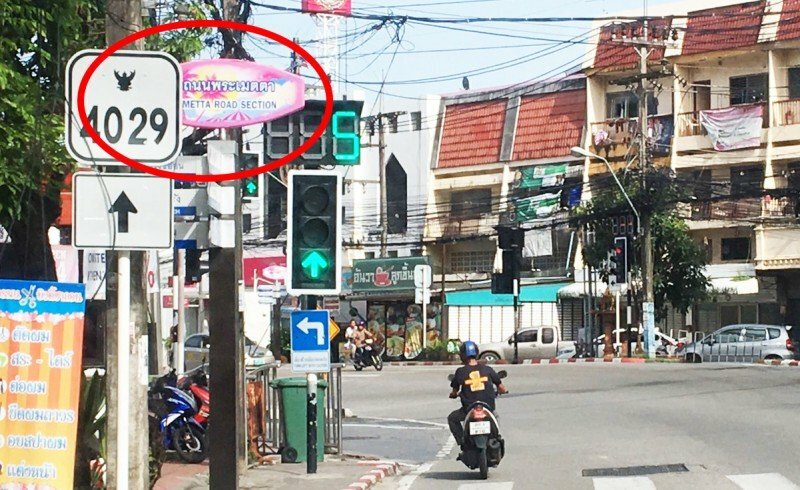 Patong Mayor Chalermluck Kebsup told The Phuket News that according to her the PDRR is still responsible for street signs along the road. “As you know this project is still under the Phuket office of the Department of Rural Roads. My understanding is it is still under the warranty period of the contract for construction. We cannot do any work on it yet,” she said. “And they have installed some signs (two, one at each of the far flung ends of the road) but the signs are in Thai only because the project plan did not include signs in other languages,” she added. “But for the name, I think we may keep it just like that to keep people from confusion. We have street signs in Thai only and are not going to have it in English,” Mayor Chalermluck said. However, adding to Patong Municipality’s own confusion, the Patong Mayor also said her office had already posted “some” signs in English. Mayor Chalermluck did not identify where these direction signs actually were. The Phuket News has yet to find any. In the meantime, an enterprising person has already had one sign installed in English at the road’s northern junction with Phra Baramee Rd. The sign identifies the road as “Phra Metta Rd”. Will this be how the road’s name will be spelt in English? According to Mr Theerapol, it should be spelled “Phra Meita Rd”. Patong Municipality and Mayor Chalermluck declined to discuss this point.